This ain't your Little Mermaid purple seashell bra get-up, ladies and gentlemen. NYFW went under the sea with oceanic greens and blues. 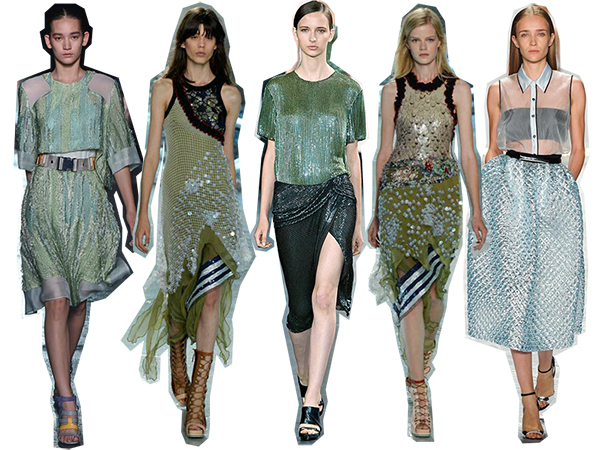 Rodarte was the ringleader of the trend with a tidal pool-inspired collection. I could have a whole separate post on the glory of the Mulleavy sisters' latest creations, but I'll just redirect you to the style.com overview and you can give me your thoughts later. Prabal Gurung had dresses that reflected the twinkling surface of the ocean shore and will look just as fabulous on the red carpet. Jason Wu did an oceanic take on his usual modern glamour. I could totally see Ariel wearing this look to meet Eric on a date (you know, if Ariel and Eric were real people living in the 21st century). And Monique Lhuillier was full of skirts and dresses that quite closely resembled the iridescent scales of a fish (or a half-woman, half-fish, as the case may be). The trend lends itself to some awesome editorial material, so hopefully Grace Coddington and the like will jump on that opportunity. And then of course there is the recently announced Sofia Coppola version of The Little Mermaid. Can I get my hopes up and pray that the Mulleavy sisters design the costumes? Great post, I love all these looks! There has been so much inspo on the catwalks for SS15! Would be fab if you could stop by my blog!